Kirstjen Nielsen has resigned as Homeland Security Secretary. Nielsen has served in this position since 2017. Commissioner of Customs and Border Protection Kevin McAleenan will be the acting replacement. President Trump has repeatedly blamed Nielsen for the rise in undocumented immigrants entering the country. He expressed his disappointment that she had not thought of more ways to secure the border. Nielsen ‘s support for Ronald Vitiello, the ICE nominee that President Trump withdrew, created problems in her relationship with the President. Nielsen supported many of the administration’s harsher immigration policies. She endorsed ending the temporary protected status program which provided residencies and work permits for people fleeing countries damaged by natural disasters or war. 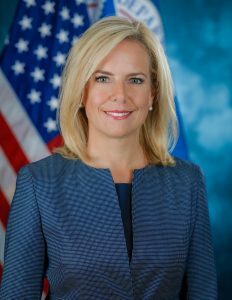 Nielsen is most well known for the “zero-tolerance” policy at the U.S.-Mexico border that resulted in thousands of migrant families being separated.